I have been using and testing gun cleaning patches for over 30 years. I’ve tried just about every brand that I could find and have made some out of old T-shirts and socks. Some are very good while others not so good. My homemade patches were not so good. There is only one brand that I still use today and that is Southern Bloomer gun cleaning patches. They are very soft, absorbent and lint/string free. The product is excellent and so is the company. I had several email exchanges with the owner and he is awesome. Southern Bloomer is an excellent manufacturer with top customer service. There are none better. I highly recommend them! 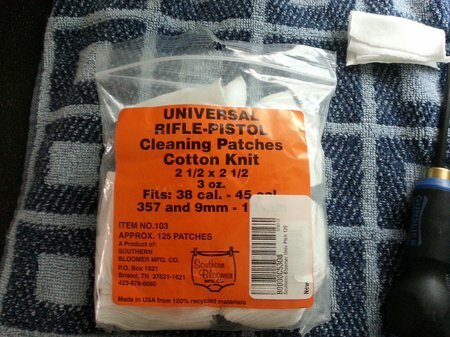 What Makes Good Gun Cleaning Patches? Another hard to find feature in gun cleaning patches is “not falling apart” while in use. A lot of patches tear or fall apart while pushed through a barrel bore. Sometimes the jag will push through the patch and leave part or all of the patch in the bore. Southern Bloomer patches are tough yet soft. They hold a good amount of gun cleaner and dirt and grime too. They seem to “scrub” the bore better than other patches. They leave it “squeaky clean”. 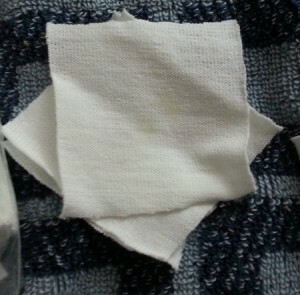 Here are a few Southern Bloomer gun cleaning patches. Notice… no lint or strings and the fine cotton knit. They really clean well. You will be surprised at how much gun cleaner or gun oil these patches will hold. I’ve had some patches that did not absorb gun oil. I placed a few drops of gun oil on a patch and the oil just sat on top of the patch. It never soaked in. That’s not a good gun cleaning patch. If oil does not soak in neither will dirt or grime. This entry was posted in Patches by admin. Bookmark the permalink.